This is the second post in the ACHIEVE Chronicles, a series about Action Communities for Health, Innovation and EnVironmental changE (ACHIEVE). ACHIEVE is a collaboration among the Centers for Disease Control and Prevention and several national organizations, including NACCHO, to provide funding, technical assistance, and training to 149 communities around the country to innovatively and collaboratively address chronic disease. Read the first post. While waiting to pick up our rental car, I was immediate struck by the southern hospitality of North Carolina. On Valentine’s Day, the older gentleman working behind the information counter handed me and my colleague, Laura Horne, each a carnation. About an hour’s drive away from the airport and about 40 miles away from Winston-Salem, we arrived in Lexington to visit with the Davidson County Health Department and the rest of their ACHIEVE coalition. On our site tour of rural Davidson County, our hosts showed us many health-forward initiatives undertaken by the community. They have had success in creating healthy concession stands during sporting events, increasing access to fresh produce from community gardens, and establishing smoke-free environments. One of their main successes has been encouraging local gas station owners to sell healthy foods. Our hosts brought us to a gas station owned and operated by Matt, a former local government employee who became a farmer and purchased and reopened the gas station. Matt knew the community did not have a lot of food options and wanted to change that. He wanted to transform the gas station into something larger and more meaningful to his rural county. Recognizing his passion, the ACHIEVE coalition collaborated with Matt to address the “food desert” in the rural part of the county, where many people did not have easy access to fresh fruits or vegetables. The coalition was able to use part of their ACHIEVE funds to purchase a cooler for Matt to use and sell local fruits, vegetables, and dairy products. Matt noticed that at first, people were hesitant to buy the new items. He was able to begin winning over customers by giving out free samples and recipes. Now his customers walk into the store and are asking for fruit, such as watermelons or bananas, when they are either out of season or out of stock. Matt’s inventory has expanded to include pantry items like dried beans and potatoes. He envisions providing an entire market section in the future. Even during winter, Matt’s return on investment is two to one, meaning that he doubles his investment on healthy foods. The ACHIEVE coalition and Matt are looking forward to analyzing the sales data and developing a model for other communities to use. Eliminating hunger and creating access to nutritious foods is complex. Working with existing businesses within a community is a first step many LHDs can take. 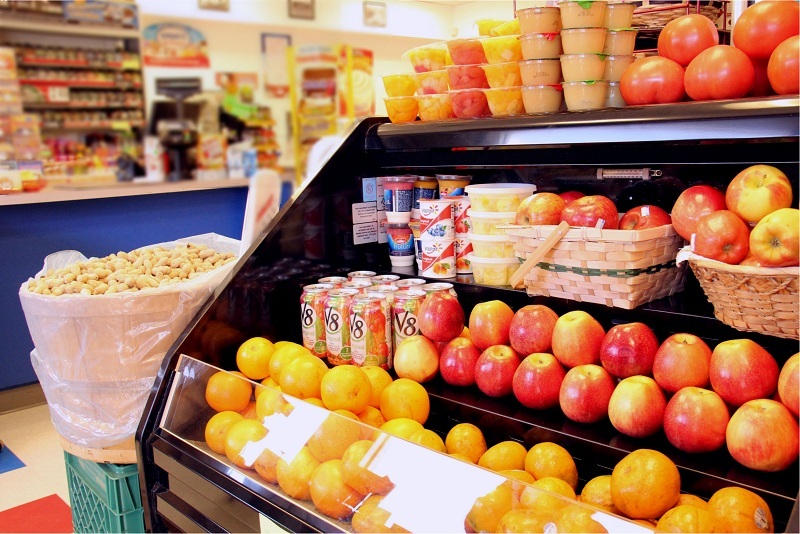 Like in Davidson County, gas stations or other central or pillar locations in a community can help support healthy food choice. For other strategies to increase food access and combat chronic disease, look for the next edition of ACHIEVE Chronicles when I visit Delaware County, Ohio. This entry was posted in ACHIEVE, community health on April 17, 2013 by nacchovoice. This is great. Just having the fruits and vegetables there, and having the gas station owner calling people’s attention to them, may have an even greater impact than the nutrition provided by whatever is purchased. If people get enough signals from their surroundings that the social norm is to take good care of yourself and eat a healthy diet, we’ll turn the corner on obesity, like we did on smoking.